I very seldom blog these days because it is so much faster to get people to engage with me directly on my Facebook but the blog can still serve as information to old relevant knowledge, trip reports with more photos and insights that can only be gathered from writing. So I guess, Jimmy from Punggol Marina must be so grateful to me that I am writing about him again! Behold! 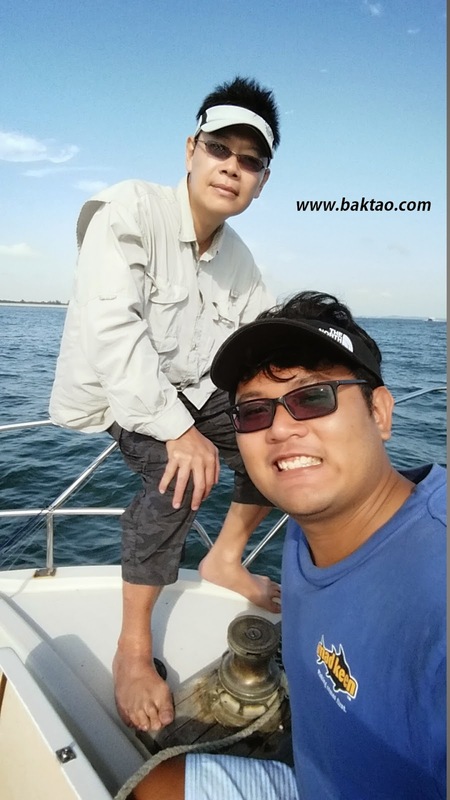 The best boatman/skipper/charter captain/RADM of the Singapore fishing scene.... but the truth is that for this Changi Offshore, we had a very stressful trip as we couldn't catch anything before late afternoon. 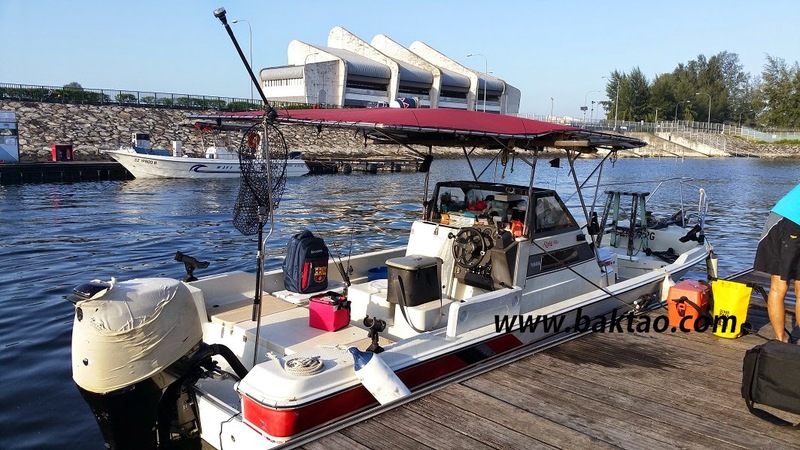 The trip to Johor Shoal and Changi Naval Base proved fruitless as the wind got in our way and fishing was tough. We only managed an ang go li and puffer fish! I guess if one can get a pufferfish on jig, that really means the sea is full of them! 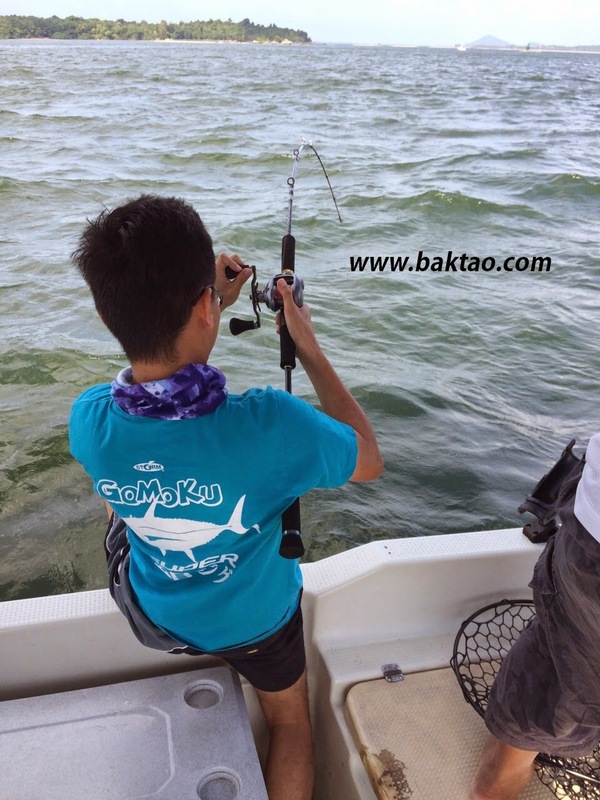 Even a cast at the usual breakers for pelagics proved fruitless and here's a video of Ah Biao working the micro jig parallel to the breakers in search of GT. Until I took out my secret ingredient for fishing. Dumplings! Dumplings are called ba zhang in chinese and some say it can be read as bao zhong which translates as sure get! 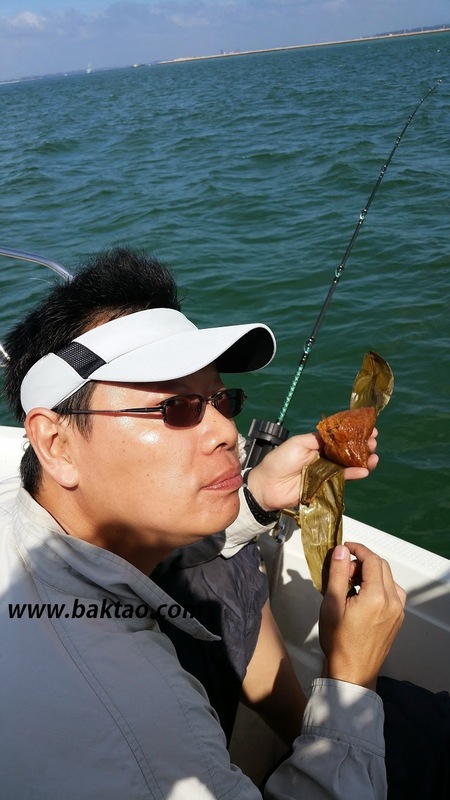 Biao was the first to eat and the first to get the fish! 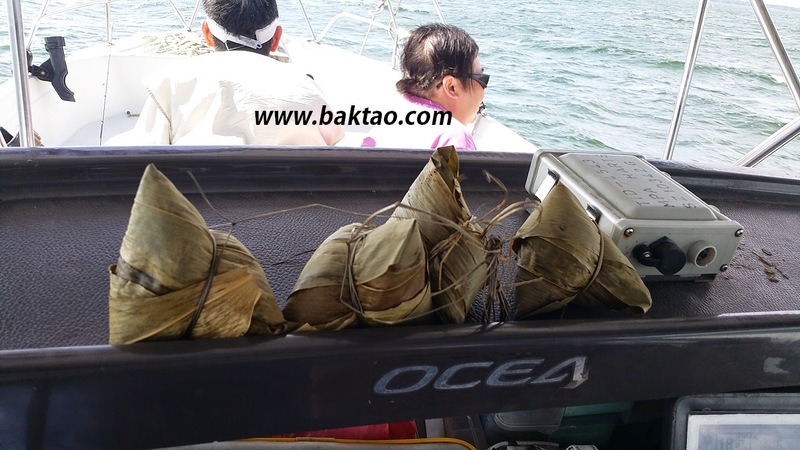 After eating some dumplings, both Weiyee and Biao had awesome takes on their Madai! With the wind subsiding, we hit more groupers and called it a day at the floating kelong restaurant. 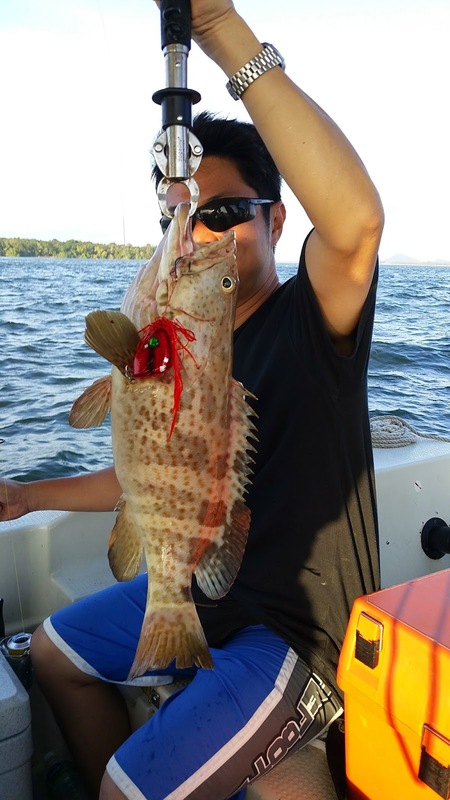 A handsome grouper on Baktao's exclusive green eye Madai! So when people ask me for tips, I say bring some dumplings! 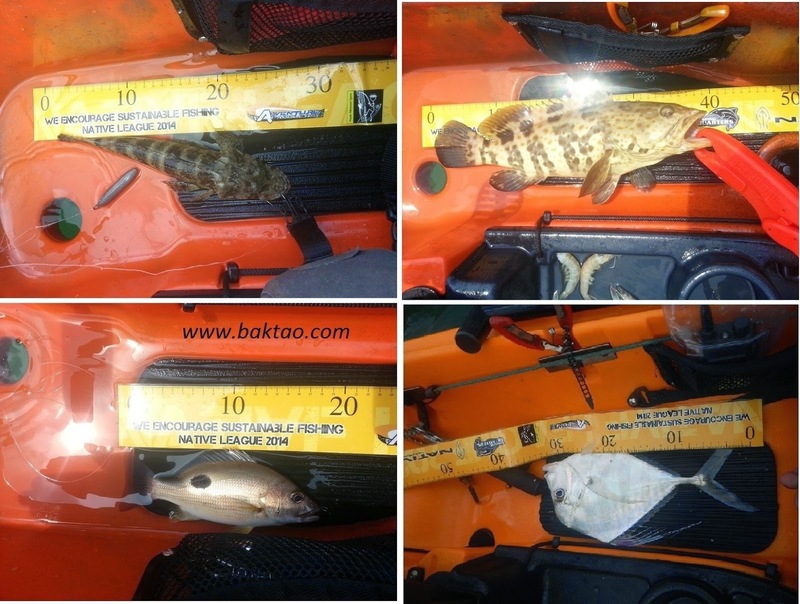 It's not everyday that you get to go Kayak Fishing in Singapore. Perhaps that's the reason why many are still ambivalent when it comes to going Kayak Fishing. 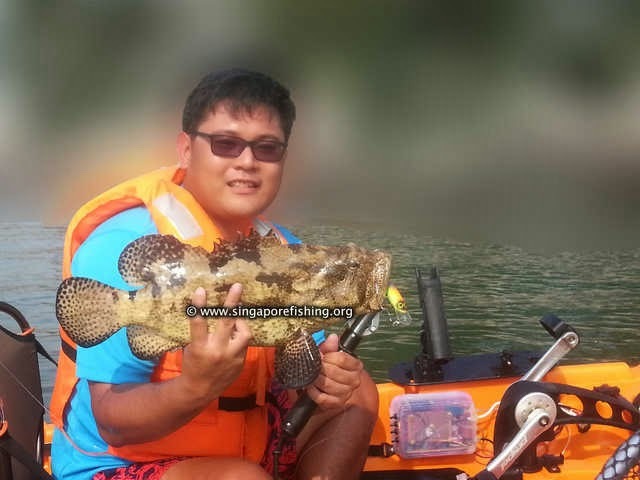 To make things worse, it's also not everytime that you go out Kayak Fishing in Singapore and get a good fish! 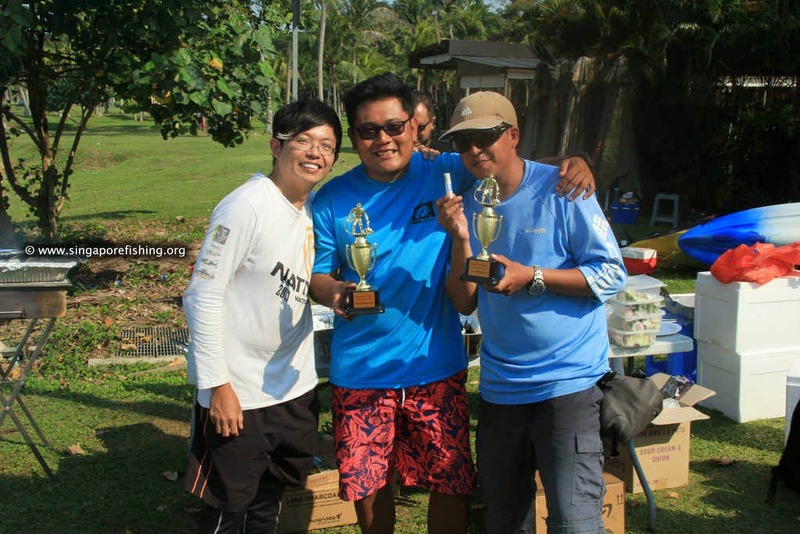 But things change when you suddenly get invited to a closed door Kayak Fishing Competition in Singapore aptly titled Native Fishing League 2014. The very thought of participating in a League would stroke most fishing egos or even mildly excite the tightly cased ones. But yeah... suddenly the thought of launching our Kayaks at Pasir Ris Beach Watercross at 7am didn't seem like an impossible task. Well.... at least for those 3 weeks of the league. The fishing league was held on every Saturday for 3 weeks and a mish mash of rules and bonus catches were stipulated by the organizers. 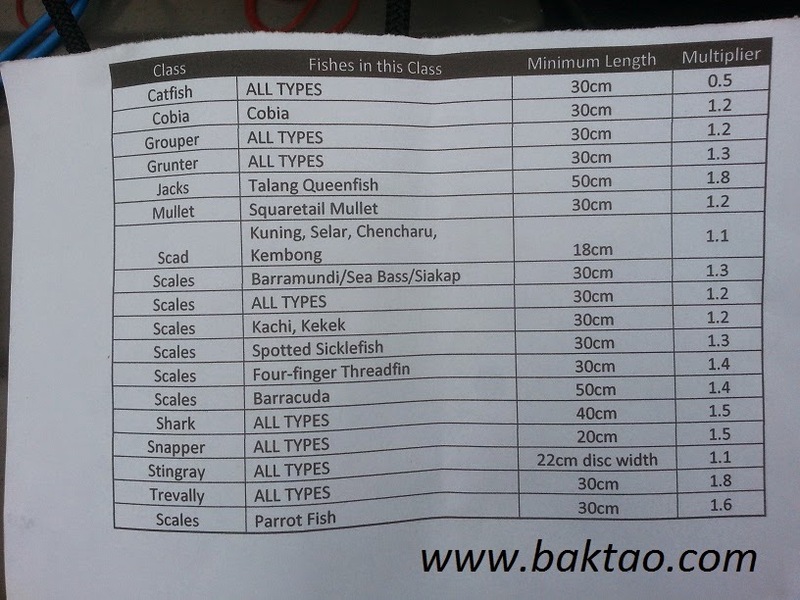 Apparently, this was a beta league and plans to include the whole Kayak Fishing Community in Singapore will be in the works in 2015. A novel scoring system was put in place with input from NUS! During the first day, we tried out some spots I knew would work if we anchored long enough for the fish to pass by. We did well during that day and managed to get up to 3rd or 4th spot as some of the competitors managed to get nothing! The third and final day was the highlight of Lucky Strike (ok I admit... by now, this post is highly biased towards myself and not my partner!). I had done trolling on boats before - light trolling in the shallows, deep trolling for Tuna... but light trolling done on a Kayak is a different story. You had to control the fish on the Kayak while ensuring the lines do not cross the propel drive of the Kayak. I've been using the Native Mariner 10 Propel for quite some time now and that enabled me to troll properly for at least 20 minutes until I got quite possibly the trolling catch of my life. Why do I say troll properly? It's quite simple - I could reverse. 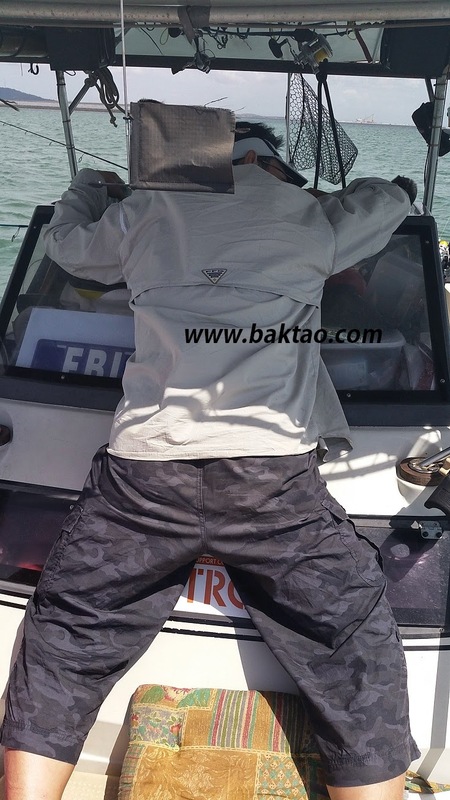 You HAVE to reverse when you're snagged or trolling very near to water breakers or estruary mangrove roots. Period. The first fish I landed on artificial was not really big but It was proof that I am slightly better than Shawn at artificials. The second fish was also kind of boring but perhaps I was not slightly better but probably better than Shawn at artificials. But the next fish was in another league of its own. This is no overstatement as the fish took the Halco Sorceror with such force that my Kayak turned. The fish was pretty heavy and took out line slowly... and all the while I was shouting to Shawn to come over! Shawn wasn't that convinced though (he was shocked later of course because he hasn't caught such a big fish on a Kayak before). After a good tug of war, I finally saw the fish and all 3 hooks of the Halco lure were deep in the fish's jaw. 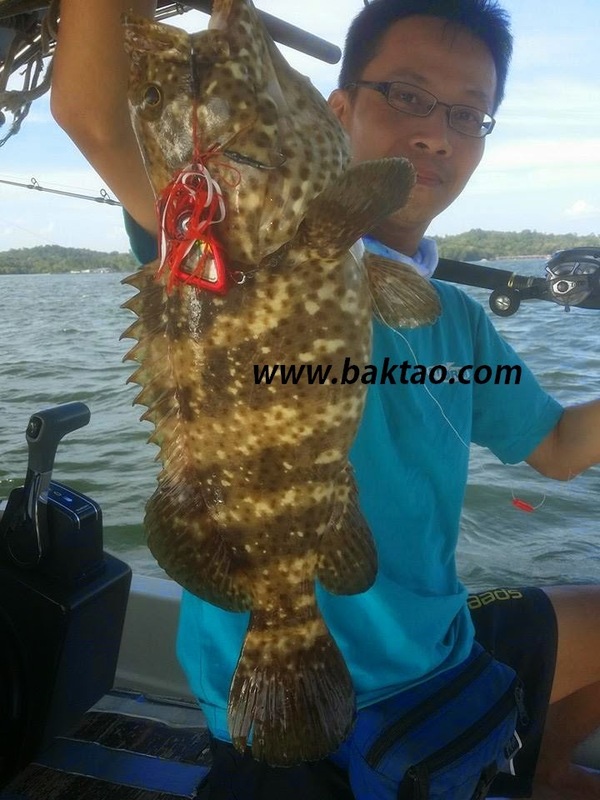 Up came a huge 8lbs Tiger Grouper (Laohu Ban) on the boga! I must confess that Shawn almost fell out of his Kayak when he saw this... but this was usual for me so I carried on with the usual photos. Halco Sorceror Elton John Colour scores! What could I say? I was envious of myself! 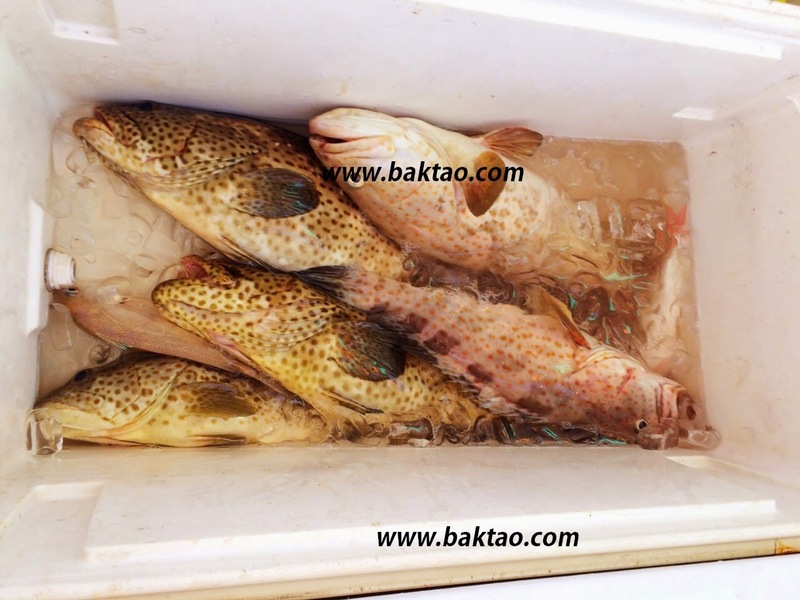 Shawn eventually landed a barramundi (it was luck) and although our fish were relatively heavy and worth much points, we were still worried - you can read Shawn's post and you can really tell that he was sore about me bringing back the Tiger! But by God's grace, we managed to hang in 3rd place and maintain our aura of credibility and authencity as one of Singapore's top fishing couple. Although we always complain alot and banter the hell out of ourselves, I must thank Shawn for introducing me to Kayak Fishing and I must say that he is a great, reliable team mate. I couldn't have done it without him. Without his catches, we still would be third but it would have been close! What do you know? We actually won something! Or you could check out the video recaps by Yak Attack. To be honest with you, this video has very little educational stuff to learn from but we just love the look of Changi Offshore Fishing boatman and fishing guru Jimmy Lim when he loses his fish amidst all our bantering! Serves you right for using light tackle and micro jigs to get the fish! Whahaha... But what a hook up in dirty muddy water at Changi! 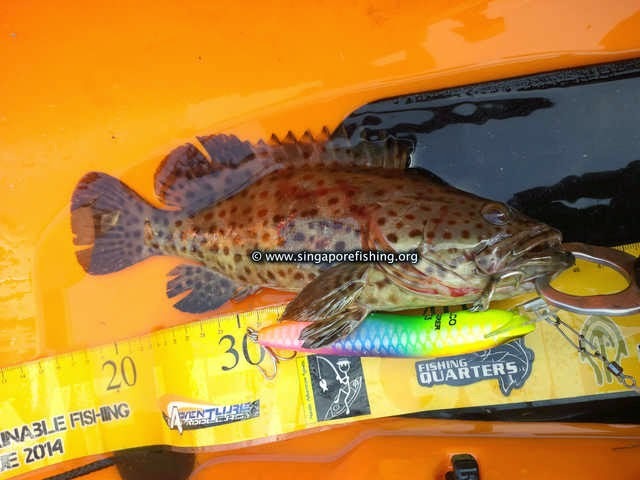 Shows us there is still hope for fishing in Singapore waters! Drifting during Singapore offshore fishing - Be it Changi Offshore or Southern Islands is a very basic but commonly used technique. Beginners often don't get it and make basic mistakes. 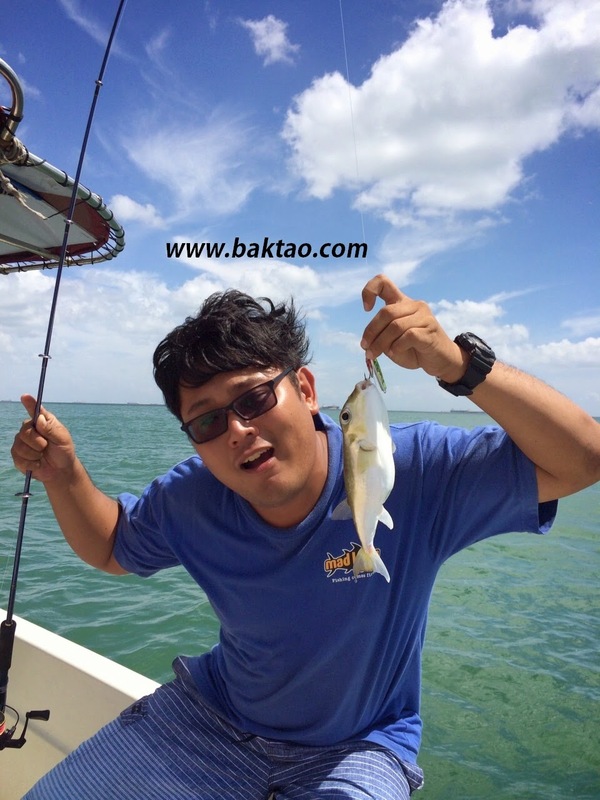 Hope that by posting this video, everyone can have better understanding and catch more fish! 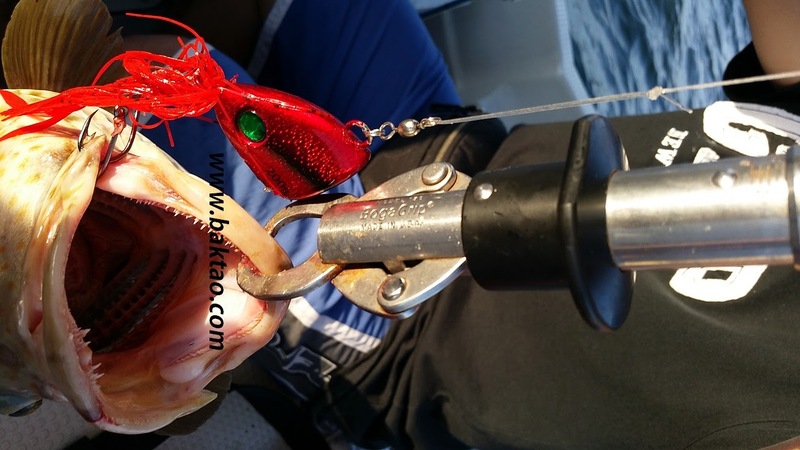 Use this technique when using paternoster (Apollo) rigs, Madai jigs, Maprawn jigs and you will lesson your chances of snagging (sangoat)!